JUSTIN’S PICK :: V FOR VENDETTA BOOK AND MASK SET: Just in time for Halloween, you too can don the mask of everyone’s favorite anarchist dandy (just don’t wear it into the gas station). And to sweeten the deal, you get a copy of Alan Moore and David Lloyd’s masterful tale of poetic terrorism in totalitarian Britain. If you’ve only seen the film adaptation, you’re doing yourself a great disservice; V is truly one of Moore’s greatest accomplishments. ANDY’S PICK :: V FOR VENDETTA BOOK AND MASK SET: Need a Halloween costume? Need to read one of the best graphic novels ever written (you heard me–EVER!!)? Well then, look no further and do all your shopping with a single gift set. 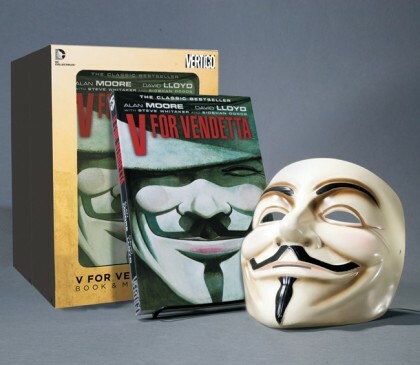 Vertigo is offering said gift set that includes V for Vendetta the graphic masterpiece written by Alan Moore and gorgeously drawn by David Lloyd along with a beautifully rendered Guy Fawkes mask just like the one worn by Vendetta’s main character V as he attempts to save a future Britain from itself. Explosives sold separately. The time (to buy) is October 3rd. This is the voice of FATE. Heroesonline prevails!